These radar images of QE2, taken from the Deep Space Network antenna at Goldstone, Calif., reveal that QE2 has a moon approximately 2,000 feet wide. A rock the size of nine cruise ships will whiz past Earth on Friday afternoon. Asteroid QE2 was not named after the Queen Elizabeth 2 (though it’s often compared to it) and – settle down – it’s coming nowhere near Earth. On Friday, May 31, at 1:59 PDT, QE2 will pass by at a safe distance of about 3.6 million miles, the closest we’ll get to it for another 200 years. QE2 is about a third of the size of the asteroid or comet that probably killed off the dinosaurs. But (hypothetically speaking!) if it did hit Earth, it’d “ruin your whole day,” says David Morrison, a space scientist at NASA Ames Research Center, near Mountain View. UPDATE: NASA's Jet Propulsion Lab in Pasadena is releasing its first radar images of QE2, and has announced that the asteroid has a moon about 2,000 feet wide. 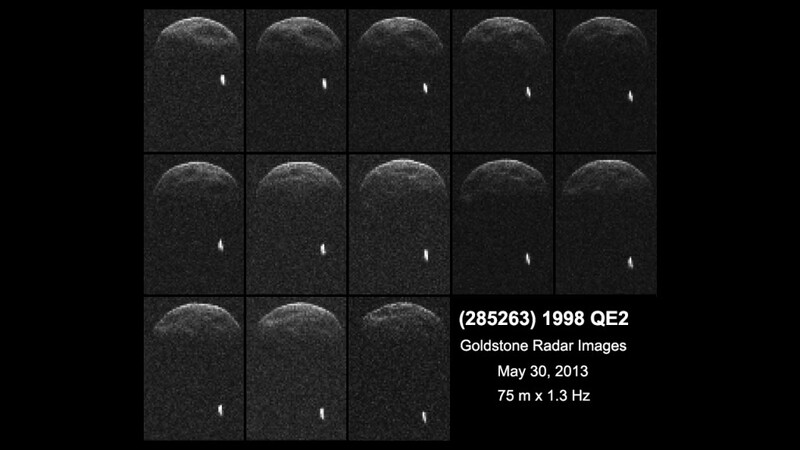 KQEDScience: What’s interesting about this asteroid? MORRISON: It’s big. This asteroid is one of the biggest ones we’ve found recently. It’s big enough that if it did hit the earth -- which it’s very unlikely to do -- it would pretty much wipe out civilization, we think. We know its orbit. It’s well observed. It’s not going to come anywhere close, this time. It’s going to be something like 15 times farther away than the moon. It won’t come back even that close for another 200 years. And as far as we can project into the future, its orbit simply does not intercept the orbit of the earth. It’s coming close enough to be within range of our big radars – JPL at Goldstone (in the Mojave Desert) and the NSF Arecibo, in Puerto Rico. They’ll be able to beam very high-intensity, very precise-frequency radio waves at QE2. When (those radio waves) are reflected back, they’ll reveal something about the asteroid’s shape, its roughness, its rotation. Sort of like a topographical map. We’ll end up with a model that you can hold in your hands, like a lumpy potato that will show what it really looks like. You’re an astrobiologist. What interests you about asteroids? Asteroids are cool. They’re the leftover building blocks of the planets. They are also capable of hitting us sometimes and doing terrible damage, like the mass extinction that killed off the dinosaurs. So they’re creators and destroyers, of great interest to scientists. Is it possible that life here on Earth actually began on an asteroid? It’s very unlikely that any asteroid ever had ancient life because they’re simply too small -- too small to have atmospheres, water and weather, which we think are the fundamental ingredients for life. But they could have brought the pieces of life to Earth, the original chemicals. Those could mix together in the Earth’s much better environment and, we think, give rise to life here. Will QE2 be visible with a telescope? It will be very difficult to see because it’s not only fairly far away, it’s black. Its surface is as black as soot. So it’s easier to see in radar than with an optical telescope. Note: Astronomers at Chabot Space and Science Center are more optimistic about catching a glimpse of QE2. The public is invited to take a look through Chabot's 36 inch telescope, Nellie, anytime between 9:00 PM and when the Center closes at 10:30 PM. And PS: Here’s a KQED Quest video on near-Earth asteroids and the scientists who love them.